For thousands of years, traditional healers have been practicing Chinese face mapping to detect and diagnose all kinds of diseases. Facial skin is sensitive and can reflect internal changes faster than other parts of the body. Learn how you can use this ancient practice to uncover clues about your health. 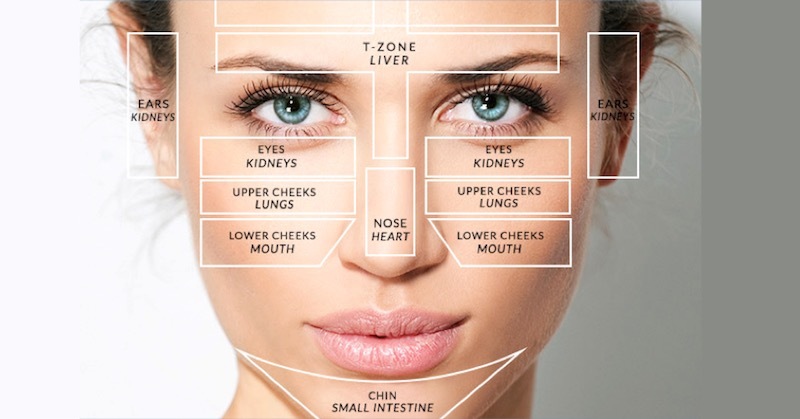 Your face is the window into gaining insight about the health of your internal organs. In fact, skin issues, like dry patches, redness or acne can be directly connected to the inner workings of your body. With that, face mapping has become an effective and popular tool to pinpoint internal health ailments and address the issue accordingly. Face mapping, especially the location of your acne or skin breakouts, has been a tried and tested method of diagnosing health ailments. As an ancient practice rooted in Ayurvedic teachings, face mapping has been celebrated as a non-invasive method of treating multiple maladies and conditions. This practice rests on the belief that your skin’s health (especially on your face) is directly connected to an organ of your body. In other words, looking at your exterior aesthetics is the key to identifying internal organ health. From smoking to hormonal imbalances, your face may be trying to tell you something! Externally-induced health issues, such as stress, can lead to acne flare up on your skin. Nearly all of these conditions or substances are within your power! While the list above may help pinpoint diet and lifestyle acne-provokers, pinpointing the location a variety of skin flare-ups have proven to also be directly linked to specific internal organs. In other words, if you’ve ruled out the health issues above, locating the specific organ at risk could be your next step. Cause: Consuming too much fats and low-fiber food leads to slow digestion, as well as too much alcohol, sugar, night life and stress. Poor digestion, toxin buildup and dehydration. Cure: Drink large amount of water, eat more raw food, avoid drinking alcohol and try to have a better sleep at night. Drinking green tea throughout the day to flush out unwanted buildup and to neutralize toxins. Cause: Your stomach is tired and doesn’t get the rest it requires. It is working too much when you consume a lot of meat and it affects the liver. This zone is directly linked to your liver. Individuals with liver diseases have been known to develop acne on noses. If you persistently have acne in this area, it could a a sign of liver dysfunction. Cure: Consume more healthy and fresh foods, get more exposure to fresh air, exercise or any other physical movements and relaxation techniques. Learn how to detoxify and support your liver naturally. Cause: The delicate skin around your eyes is connected to your kidney health. If you always have dark under-eye circles, this may signify poor kidney function, malnutrition or dehydration. Other causes of breakouts in this area are smoking, drinking alcohol, poor circulation and a weakened heart. Cure: Drink plenty of water, reduce caffeine intake and avoid the intake of sweetened drinks and alcohol. Cause: Linked to lung health, your upper cheek skin issues could indicate that you are inhaling high quantities of polluted air. Also, there is a possibility of dark circles around your eyes. Cure: Do not be exposed to polluted air or cigarette smoke (even second hand smoke). If you are a smoker, quit it as soon as you can. Start some exercises or additional physical activities through the day. Cause: Covering your gums, lower cheek acne issues are indicative of poor dental hygiene. Remember to regularly brush and floss your teeth, while avoiding sugary foods and drinks. Other causes are smoking, stress, unhealthy food and excess consumption of sugar. Cure: Avoid eating the unhealthy foods, and use only high quality or natural cosmetic products. Cause: Your nose is linked to your heart. Swelling, redness or acne on the nose have been linked to high blood pressure and hypertension. Polluted air, enclosed space, gas, bloated stomach and poor circulation. Hypertension can also lead to many issues in this part of the face. Cure: Try reducing salt consumption and increase your heart-healthy fruits and vegetables to lower your blood pressure, check your cholesterol level. Drink organic green tea in order to eliminate the toxins from your body. Exercises are beneficial. Cause: High-fat food that is loaded with fat, sugar and stimulants such as caffeine and alcohol. This area is most impacted while using spiced foods. Staying up late in the night, and stress can result in imbalance. Cure: Consume fermented foods that will balance your organism. Consume large amounts of fruits and vegetables. Small lifestyle changes can keep your digestive tract running smoothly. Cause: Overall intake of salt, season food and drinking small amounts of water. Also the overall consumption of caffeine can cause problems. Cure: Reduce the intake of salt, seasonings and caffeine. Drink large amounts of water every day.